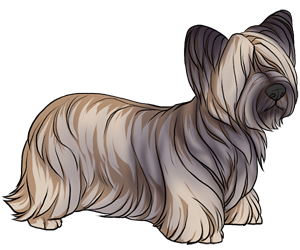 In the 1600's, a ship that had Maltese dogs crashed on the shore of the island Skye and bred with the indigenous dogs, resulting in the Skye Terrier. The breed became exceedingly popular among the nobility of England during the 19th century. Were used to hunt vermin, fox and badgers. The AKC recognized the breed in 1887.